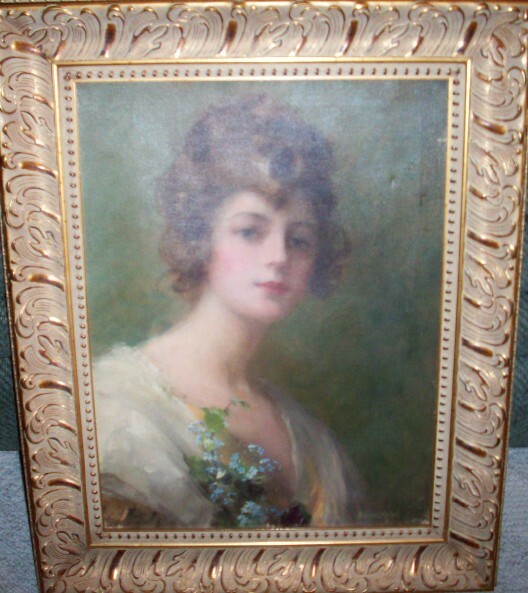 This F. ( Frederick) Howard Michael oil painting titled " Forget Me Not" and was painted around 1915. It is an oil on canvas. It measures 15 x 20 inches outside of stretcher board to outside of the stretcher board. It measures 21 x 26 inches outside of frame to outside of frame. F . Howard Michael was an English artist born in the 1880's and passed away in 1929. The signature is on the lower right corner. A painting titled "Titania" that Frederick Howard Michael did for the Shakespeare Play "Midsummer Night's Dream" sold in 1986 for $9,700. Ted Gerlach the owner of the Gerlach Barklow calendar company would often travel to England and purchase paintings to be used by his calendar company. On the stretcher board is hand written "Theo. J. Gerlach Joliet Illinois". The Gerlach Barklow Company used several of F. Howard Michael's paintings for their calendar images. It is in very good condition with a few very small scrapes and one very small hole in the upper right hand corner.